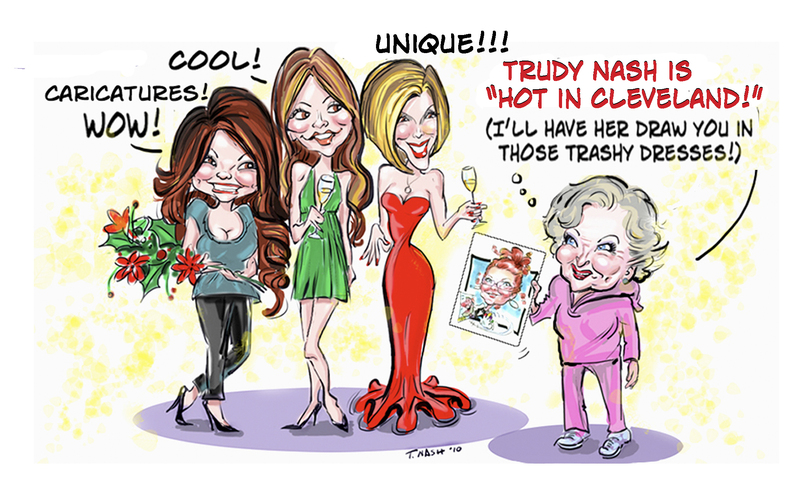 Caricature Cleveland | Trudy Nash | 440-526-7029 | I provide caricature entertainment at special events, weddings, birthdays, graduations, conventions, retirements, etc., etc.,etc. 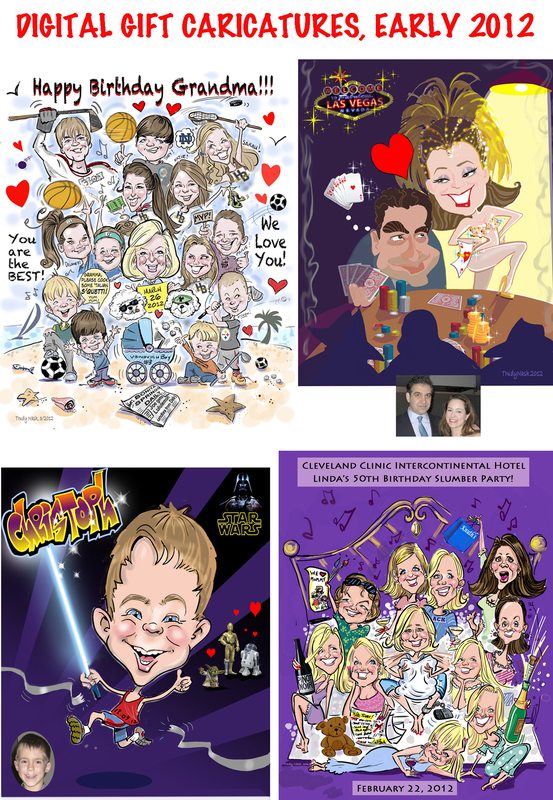 Video Sample of Caricature Entertainment! Here’s a very nice thank-you note for my live caricature entertainment at the party after the film premier of “Keeper of the Keys.” Thank you Lisa of grategy.com! It was so much fun! Drawing caricatures at the film premier of "Keeper of the Keys." 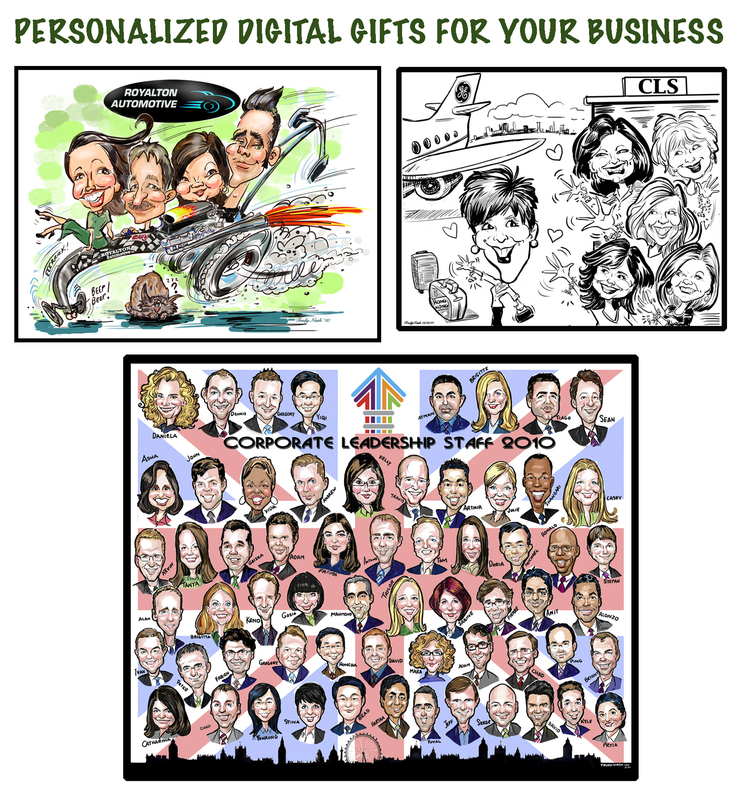 I love drawing personalized DIGITAL caricatures for unique gift-giving that lasts a lifetime! Just send me photos and I'll create a personalized fun digital portrait! 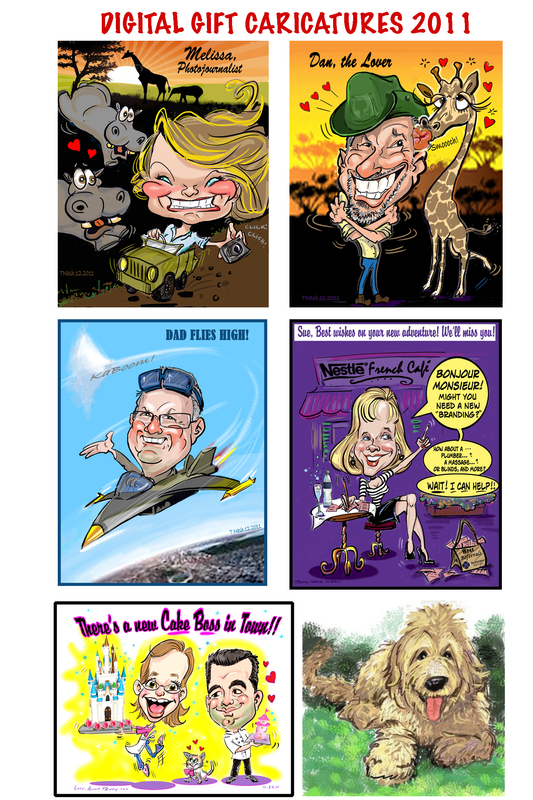 I spent the past 4 days drawing caricatures at a wonderful little community festival called “Home Days” in Broadview Heights, Ohio. It was a huge success and the weather was great for the most part, but hot (better’n a snowstorm). The people were absolutely fabulous, friendly and appreciative. Here are only a couple of photos I was able to get when I didn’t have a line waiting to be drawn. My grandkids, Alec and Adriann, helped me out as you can see… especially Alec who , at 12, was a master at keeping the space organized and efficient. I debated posting this, but the theme is getting outdated so I thought I’d give it a “gogh.” The scenario needs explaining. I was cautioned by friends that Oprah saying “Who Dat” would give this picture racial overtones. But “Who Dat” is the New Orleans Saints’ trademark that fans chanted throughout Superbowl (“Who Dat, Who Dat” ) and t-shirts sold like hotcakes motivating the Saints’ owners to pursue a “Who Dat” trademark! 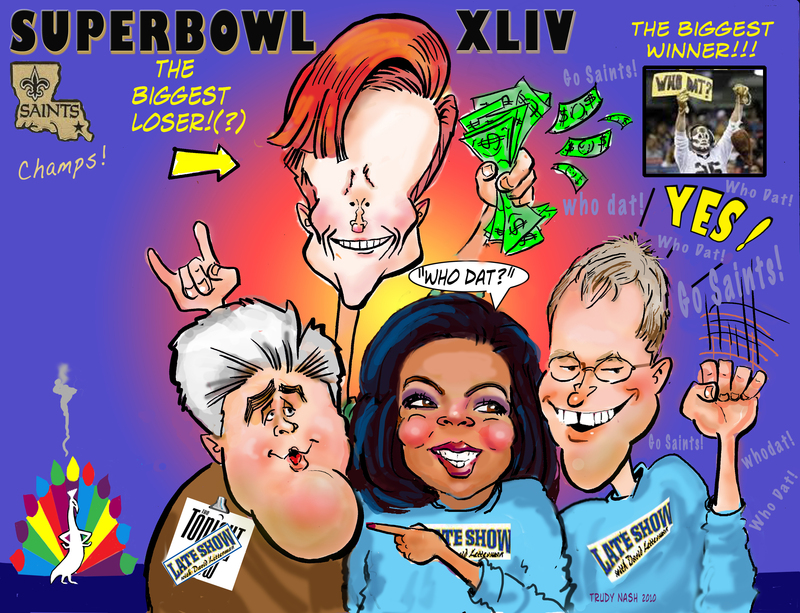 My picture depicts Leno, Oprah and Letterman, during one of the top commercials aired on Superbowl XLIV, seated on a couch in this same order . Leno dropped into the commercial as a big surprise since his Tonight Show is a network competitor of the Letterman Late Show. (That’s why the NBC Peacock is looking miffed). Conan O’Brien was just given about $40 million to leave the Tonight show and give it back to its original host, Jay Leno, making him the “Biggest Loser” (named for the popular weight loss reality show) who lost the Tonight show but won the money! I wouldn’t have to explain any of this if everyone knew of the controversial Tonight Show switch, saw the Superbowl game with Leno, Oprah and Letterman on the couch, and understood that “Who Dat” was a term of endearment meant specifically for the New Orleans Saints who were the Big Winners of the Superbowl. (Phew!Cartoons shouldn’t have to be explained).